Some days ago I was talking with a friend about the infinite monkey theorem which is a funny interpretation of what thinking-in-infinite can produce. The same day, in my weekly English class, my teacher said that Anglo-saxon words do tend to be short, very often monosyllabic such as function words such as to, of, from etc and everyday words such as go, see run, eat, etc. For example, around 38% of two-chars words match with English dictionary and only 9% with Spanish one. This is why I think that, in the infinite, I would be easier for a monkey to replicate a Shakespeare text than a Cervantes one. Interesting, but I don’t think so – surely the theorem works on the basis of the monkey typing one letter at a time? 2) Secondarily the number of letters in the language/alphabet of the work. Therefore Don Quijote would be ~ 29^1 617 750 TIMES less likely to pop out than Macbeth, no? Totally agree, Macbeth sounds much easier. Title is just a way to illustrate the experiment between looking for random words in both dictionaries. Thanks for your comment. 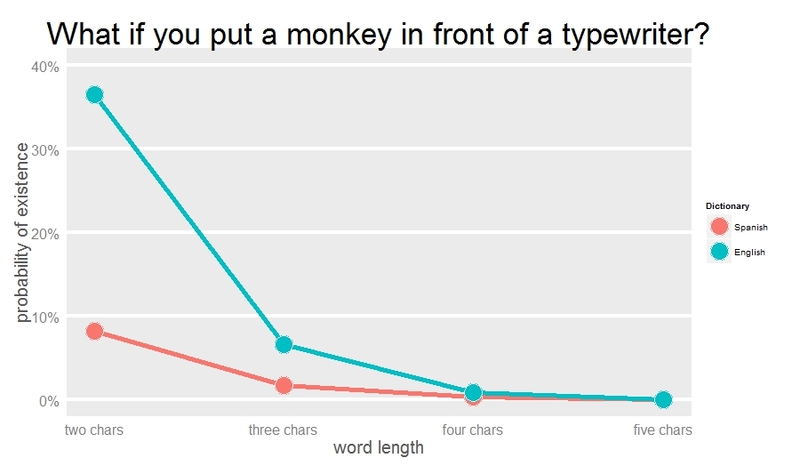 Is a monkey more likely to hit the space bar than other keys? It’s bigger? Are they more likely to hit the keys in the middle of the keyboard than at the edge? The experiment assumes all keys are equally likely, but I don’t know if that’s a reasonable assumption. Since I simulate isolate words I don’t need to take care about space bar. I agree not all keys are equally likely. Mine is an approach which serves as reasonable argument to support my hypothesis. Thanks for your comment!